It's not going to be easy this weekend for the inmate at Hiland Mountain Correctional Center when a song she wrote for her daughter is performed for a live audience. Feelings that have been so personal will be shared for the public to hear. "I'm a really private person. I don't like nobody to know my feelings or anything. So, it's really difficult for me," she said. But writing the song at all, as part of the Hiland Mountain Lullaby Project, has already been meaningful, Zittnan said. She said the experience has pulled her away from the isolation where she tends to retreat as she serves time. 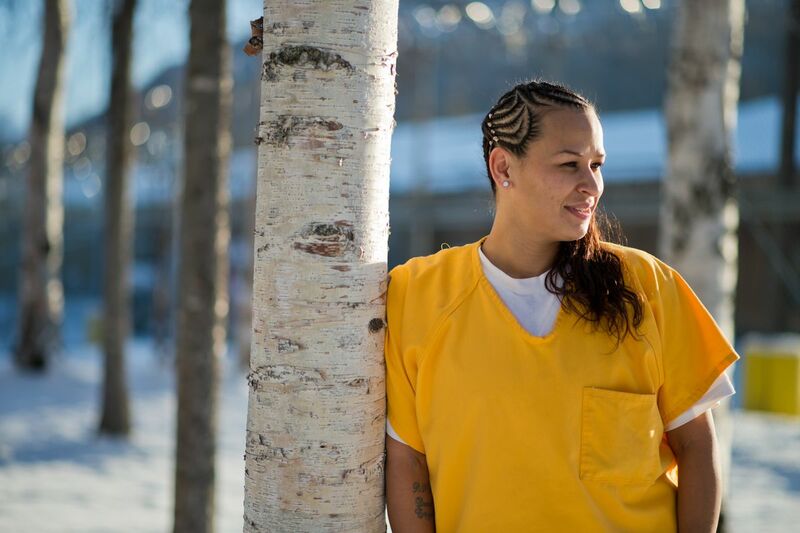 "I didn't think I could accomplish something like that," she said inside the prison this week. Zittnan, 33, has come this far with help from someone familiar with her journey. When she wrote the song in late September, she had help from Shana Jones, who was released from prison last year and who used some of the few personal hours allowed by her ankle monitoring program to come back inside and lend support. Zittnan, who said she's in prison for the third time for drug-related offenses, remembered Jones from when Jones was incarcerated. They lived in the same housing unit. Both were mothers. Both say they had struggled with heroin addiction for years. Last year as an inmate, Jones wrote a lullaby for her own children. Now Jones, five years sober, is one of 15 mentors who volunteered to help and one of two who are former inmates. Pairing former inmates to help current ones write songs for their children is a new twist this year. Organizer Shirley Mae Springer Staten calls it a way to develeop a 2-year-old program modeled on one begun by Carnegie Hall's Weill Music Institute. Anchorage-based Keys To Life hosts the project at Hiland. Springer Staten hopes former prisoners like Jones can lead by the example of their improved lives. "There's a tenacity about her that she's going to make it work this time," Springer Staten said. 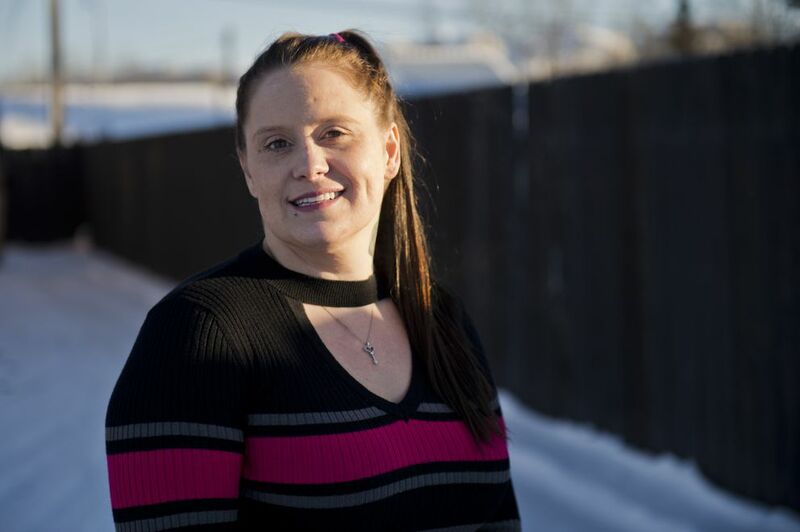 For Jones, 37, it's been a long road toward confidence, an uphill climb that began the day after she entered prison for her second felony drug conviction in 2012. Jones said her addiction to painkillers and heroin began when she was 21 and took control of her life for 12 years. "I wasted so much of my time," she said. Jones, who grew up in Palmer, has two children. She began her last prison term 19 days after the birth of her son. At the time, her daughter was 1. "Something clicked and I was like, 'I will never use again,' " she said. "I pray that I will never use again." While in prison, Jones participated in addiction treatment programs and signed up for a building maintenance apprenticeship, eager to prove to herself and her family that she was capable of making lasting changes. Shortly after she was released, she found work as a customer care specialist for a business that markets Xerox machines, a job she takes pride in, she said. But her relationship with her children has been harder to repair. Both had been adopted, each by different grandparents. While she sees her daughter as often as the ankle monitoring program will allow, she hasn't been allowed contact with her son, a decision of his adoptive parent, she said. "She doesn't think that I'm going to stay sober. And I get that she doesn't want me to go in and out of his life, because that's what addiction does to you. And I understand all that, so I prepared myself mentally before I even got out of jail that she wasn't going to let me see him," Jones said. "It's just going to take time." On a Saturday in late September, Jones sat on the bleachers of the prison's gymnasium with Zittnan to share ideas they could turn into music. Her own experience, Jones hoped, could help someone who is facing familiar struggles. She recalled the laughter and tears she shared last year while writing "I Love You More Than All The Stars In The Sky" for her children. "Once you tell somebody your story, it gets much easier, and you're not carrying that weight so much," Jones said. But the songwriting process didn't come easily to Zittnan, who is from Kodiak. "It was hard because I didn't know where to start or how to begin," she said. The inmate participants had written letters to their children, an exercise that was intended to inspire the lyrics. Zittnan called her letter too sad for that purpose. Hers was an apology, and writing it was hard. "It hurt, but it felt good," Zittnan said. Zittnan keeps the letter with her in prison, and someday she may send it to her daughter, who lives in another state with her father. "She moved to Hawaii when she was 3. That's when I first came in here. … She doesn't really remember me," Zittnan said. Jones suggested another theme she found in Zittnan's writing. "In her letter, she kept saying, 'I want you to know I think about you every day.' It kept coming up paragraph after paragraph," Jones said. With help from musicians that day, the two created a more whimsical song with a reggae beat. It recalled the antics Zittnan remembered in her daughter, whom she described as a daredevil. It's titled, "I Think of You Every Day." Zittnan, who said she has remained clean since she began her most recent prison term this summer, hopes to take part in a drug treatment program. She has been working full-time while incarcerated as a caretaker for a woman with disabilities. She's not sure she can muster the courage to be onstage Saturday when Anchorage musician Dr. Tamara McCoy sings her song in front of an audience. But she's looking forward to sending the song to her daughter, something the girl's father has agreed to, and hopes it will be a step toward reconnecting one day, she said. "When I do get out, I'm going to work towards that. I just don't want to disturb her now while I'm in here working on myself," Zittnan said. In the meantime, she hopes the song will carry an important message — that she never forgot about her daughter. "I hope that every time she hears that song that she'll think of me," Zittnan said. The Hiland Mountain Lullaby Concert is Saturday at Hiland Mountain Correctional Center in Eagle River. Audience members are required to get advance prison clearance and can purchase a ticket from CenterTix. Find more information here.